LOL – well, I “scheduled” the blog post and then never actually filled out the content! This was one of the things I’d forgotten to do. Step 2 Decide when you want the article to post to the public. I generally prefer in the morning and avoid weekends. Step 3 Schedule the post. I’ve already published this post. 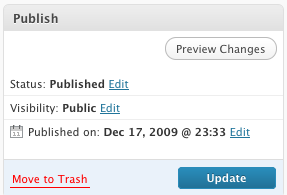 If I wanted to reschedule the post, I could click on the Edit link next to the date the blog was published. Step 4 Click the blue Schedule button that will appear after you enter in the appropriate date and time. This entry was posted on Monday, December 21st, 2009 at 9:33 am and is filed under Blogging Tutorials. You can follow any responses to this entry through the RSS 2.0 feed. You can leave a response, or trackback from your own site. Nate, I am a Prosper student. I watched your Blogging 101 (replay) and found it very interesting. I have 102 started in another window. I have a question for you. You mentioned that your wife blogs and has hers done a month in advance. How does she do this? Is there a way to do them and not publish them right away? Where are they stored for later use? Nate, yes that was helpful. I will have to try it before it will stick in my brain. I am still doing research and hope to have a paid blog up an running in the next week or so. Nate, I just got my blog up today. I went through blue host and wordpress. It was quite an adventure! Your webinar made me a little more confident once I got to my dashboard. I was able to download a Theme and I am thrilled about that! I have another question. How do you link to a PDF file so someone can print it out? I don’t really want the file to appear on my blog except as a link ie. a multiplication chart. Thanks!